Excuses, excuses. I’ve been laid low with an awful cold since last weekend and have slothed around for a few days trying to get better. The Talisman e-Book is almost ready for test driving, and I’ll be asking three SHARDS readers to do that for me as a favor and give feed back. Hopefully, that will happen in the next day or so. When you have just three hours to get into a process, it’s best to limit yourself by size, structure, and color palette. We did a warmup painting on 9×12 watercolor paper, then moved to a 12×12″ stretched canvas. Some of the painters reflected the same style with both pieces and some branched out. We had one of the best discussion on composition and color than I can remember having lately. It was a great group. Some had never painted before and others had much experience. That diversity is so helpful in designing effective workshops. We started with layers of scribbling and stenciling just to “get the door open” and went from there – fun. 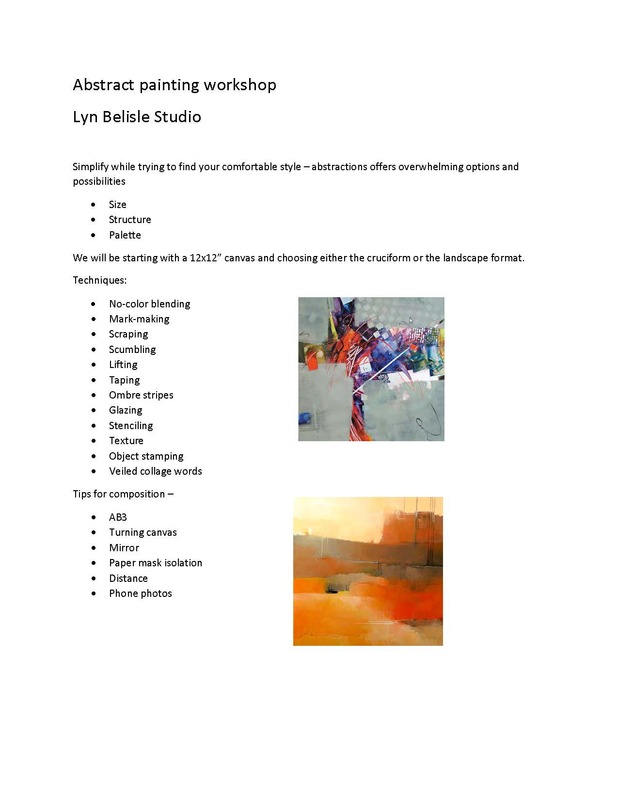 Abstract Acrylic Workshop from Lyn Belisle on Vimeo. Excuse any typos in the video – I’m overdosed on cough medicine! This entry was posted in Abstract, workshops and tagged acrylic, limitations, scribbling by lynbelisle. Bookmark the permalink.